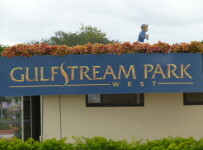 Gulfstream Park West plans an 8-race card today, with a first post time of 12:30 PM. Sixty-seven entries are listed. All races are either claiming, or allowance races, with races 4,6 and 8 listed as turf races. Race 8 will post near 4:00 PM. 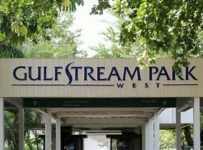 On Sunday, the last live racing day, 66 starters ran for $285,000 in purse money in 10 races. Seven favorites entered the winners circle, even as all 4 dirt races were changed to turf. The payouts were tiny, as the highest odds-winner on the day was just 6:1 in race 6. The late pick 4 paid $20.85, the late pick 5, $182, and the Pick-6 $99.84 to approximately 150 ticketholders. Forty-one horses were available for wagering the Rainbow 6. This is just the third day of this Rainbow 6 cycle, as the jackpot was hit 3 days in-a-row; Oct. 27,28,31. 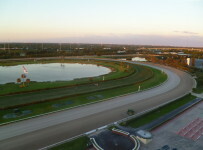 The carryover today will be $20,774. Total handle was $2.845 million, the lowest Sunday total in this Fall meet.